This app contains 100 puzzles. 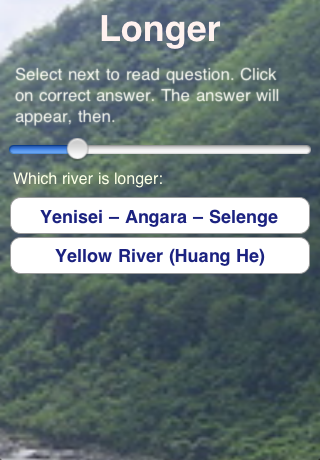 It asks the operator to determine which river is longer. The app lists 2 options in each puzzle. In total the app investigates 200 rivers. The app lists the correct information about the two rivers after the operator chooses his/her answer. Music is played in the background to add enjoyment.